The AAQI Auction is On!! The AAQI auction for the month of June is up and running! So, run over to the site and drool over the little art quilts up for auction - there are some real beauties this month! Very exciting for me is that my quilt, Asian Dreams, is on the block this month! I can`t wait to see how much money it manages to raise for Alzheimer`s research! Keep your fingers crossed it does well. Well, it only rained three times yesterday which was a huge bonus - I actually managed to mow 20 of the 100 sites! Since it didn't rain at all today and the sun shone, I was able to finish all the mowing and am caught right up on that job. The beavers are still determined to destroy what few trees that have managed to grow here on the bald prairie. Sooo frustrating. There are two of their big dams in the canal now so they must be multiplying. More beavers - fewer trees! Carrying on with my summer reading, I have three Michael Slade books here in my pile. Kamikaze: Michael Slade is actually a pen name for a father and daughter writing team from Vancouver, BC - more books by Canadians! I enjoyed this because I am familiar with Vancouver and can picture the streets and landmarks they refer to. For murder/mystery fans, Michael Slade is another author you can add to your list. Bit of a warning though - the violence can be quite graphic and gory in these novels. If you can get past that though, or if it doesn't bother you, they are pretty good mysteries jam packed with a lot of authentic information on the RCMP (Royal Canadian Mounted Police) and, in this case, quite a bit of historical facts relating to the World War II as it related to the Pacific region. I have always been disgusted by the use of atomic bombs on Japan and I picked up more information here that reinforced that - gained a better understanding of the political motivations behind it. What a shameful day in history! The third in the pile was Bed of Nails. After the second page I knew I had read this one before so didn't bother getting any further into it. If memory serves me correctly, it centered on a mental patient who believed he was Jack the Ripper. For DVDs, I finally managed to see Slumdog Millionaire. I didn't see it when it was in the theatres and then when dd saw it she told me she couldn't see what all the hype was about. I bought the DVD and it sat there for another year before I finally watched it yesterday. Great movie! I can understand why it won awards. Here is the Encrusted Beading Stitch for BAS (Build a Seam) #69. I hope you have as much fun playing around with it as I am. There is a tutorial in the next post with more photos. Have fun! 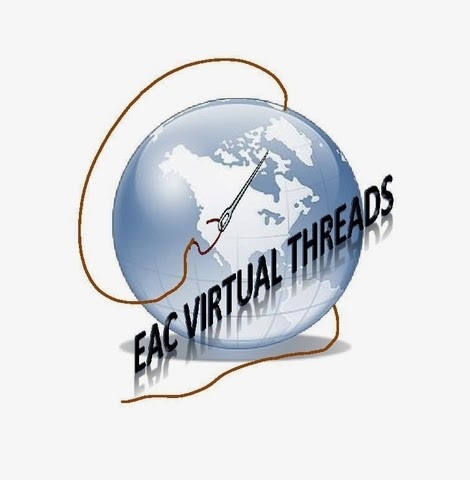 Make sure your thread is well secured as always with beading. Bring the needle up in the area you want to encrust and thread on three beads. Take the needle back down very close to the same place you came up. 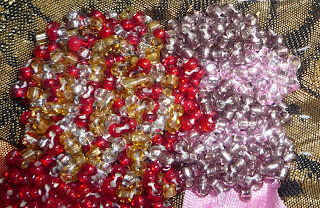 This little "bead lump" is what each stitch looks like when it is done. Here you can see the type of effect you can get using this stitch - such fun! I hope you enjoy it! The weather is getting me down with the constant downpour and the grey skies so I find myself not able to stitch much as a result. My stitching is a joy and I find it hard to do when I am feeling blue myself. I discovered Jodi Picoult last summer while I was looking for a new fiction author. This is one of several of hers I have read now. She seems to choose a thorny subject, in this case child abuse and the way the judicial system makes the children victims all over again, and builds a pretty good story around it. Good read. This is a fictionalized account of the siege of Sarajevo, based on facts but combining the events of years over the course of one month. The story is written from the perspective of several individuals living through the siege of the city. This story touched me - I felt like I gained a better understanding of what the citizens of Sarajevo went through during this tragic time. I recommend this book and am proud to also be able to mention it is written by a Canadian author. A novel about Sylvie, a child born with severe mental challenges and grand mal seizures, and her family. The story is told from the perspective of members of the family on Wednesdays in three consecutive decades: the mother, Jacqueline, in 1961, the father, Lloyd, in 1973, and Lesa, their oldest daughter, in 1987. This is not a comfortable read but it is a good one. You feel a little voyeuristic, almost as if you know more than you want to about this family. As time progresses in the novel, though, you understand more of the family dynamics and understand everyone better. A very human story written not only by a Canadian, but by a fellow Albertan. An American author this time, and a good one. She has a first novel available too, Strong for Potatoes, which I am going to get my hands on. This is a good read - basically a love story but not a bodice-ripper by any means. A man living in self-induced isolation in Maine after the death of his wife and children in a fire, a young woman, eight months pregnant, who stumbles to his home in a terrible ice storm. The characters are complex and it is an enjoyable book. I will always read Cornwell's novels as they appear - she is one of my favourite mystery writers. I love the Kay Scarpetta character and this is classic Scarpetta. All the old characters are back and it was not disappointing. If you are ever looking for an very un-Scarpetta novel by Cornwell though - give Isle of Dogs a try. I very much enjoyed that one. It is funny that I find myself unable to read any fiction at all in the winter, but in the summer I revert to my childhood habit of almost a book a day. Doubt, with Meryl Streep and Philip Seymour Hoffman - great movie - has Streep ever made a bad one? And every time I watch Hoffman in something I am struck all over again with what a really fine actor he is. Two thumbs up! This is a good one for the spy and mystery readers like me and has enough action to keep the husband occupied. Good movie. No, I didn't watch this just for a glimpse of Hugh Jackman semi-naked! lol That was just a bonus. I enjoy the comic book movies, X-Men, etc. and this was a good one. Love the Wolverine character - pure escapism. Ironman 2, with Robert Downey Jr. Loved the first Ironman and loved the second one too. Same comments as above - fun flick. Okay, so there is a long boring post with no photos. I'll get back to stitching now so I have something more interesting for you! At this year's EAC National Seminar, I had the choice of several tours and activities on the free day between classes, or to take an additional one day class. Well, I took the class since I was there to soak up as much new knowledge as I could! My free day class was taught by Silvia Murariu, a noted designer of Romanian Point Lace. Please click on the photo above to enlarge it so you can see as much detail as possible on the vest Sylvia is wearing. The lace on it is jaw dropping and of course all made by Sylvia. We learned how to crochet two types of the cord in the class although the kit contained the cord all done and ready for us to use. These are samples of various cords that Sylvia had in class for us to see. I have found a wonderful article by Sylvia in an old issue of the EGA magazine which has very clear instructions as well for making the cording. We had the opportunity to see some of the books Sylvia has written and they have all gone onto my wish list as a result. I especially like the Christmas book with the angels, trees, etc. Perfect for motifs! Samples of Sylvia's exquisite lace were on display for us to see. I was amazed at the results that could be obtained from a technique that is much easier than it looks! By combining the Romanian Point Lace with other forms of stitching, Sylvia creates wonderful projects which she teaches in longer classes than the quick little one I took. She was a very good teacher and had great teaching aids and instructions. I would be happy to have the opportunity to take another class in the future and learn more from Sylvia. In the meantime, I will have to be content with finishing my small project and learning as much more as I can on my own. I would like to teach this technique to others and Sylvia is very supportive of this. She says the more people that have learned Romanian Point Lace the better, because it allows her to get back to her first love of designing! If you would like to learn more about Sylvia Murariu and Romanian Point Lace and see what books and kits are available, I would recommend you visit her website. This week's BAS (Build a Seam) Challenge stitch was suggested by Leslie Ehrlich and is called the Renaissance Stitch. The photo above is from Sharon Boggin's wonderful Stitch Dictionary and you can check out Sharon's tutorial on this stitch here. This is a new stitch to me so I can't wait to see what to do with it. I love the way it looks in the variegated colours! One of the two day classes I took at the Embroidery Association of Canada's National Seminar in Sackville, NB, was the Harvest Penny Rug. These are some of the other pieces that Deborah had on display for us to see in the class. A lot of them are available as kits at her website. Her background in graphic design really shows up in the gorgeous colours of her pieces and I can't wait to finish the Harvest Penny Rug and start another. 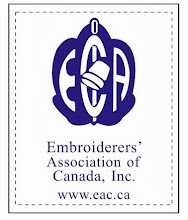 I bought a kit for one of the Vintage Elephant Sewing Kits and am looking forward to making that as well. Working with felted wool is something I have been interested in but never attempted before and I came away from the class confident in my ability to finish the project and do more in the future, which unfortunately is not always the case. So, hats off to Deborah for a wonderful class - great project, good teacher! What more could you ask for? By the way, I am inspired now to add a wool crazy quilt to my list of future projects! We had a round robin on the CQI Novice group that I was acting as angel for. The angel takes up the slack and stitches for anyone who has to drop out or has fallen behind. Well, in this group of five ladies, two of them dropped out right after they mailed their blocks! So, I was up to my ears in angel stitching for awhile there. Happily, though, I have mailed off the last three blocks to their owners and this round robin is not sucessfully completed. This first block (above) was Ely's. I had already stitched on once and finished it up when it came back to me for the second time. There were an extraordinary amount of seams on this block, or at least it seemed so! I added a trim to cover one seam where the fabrics were fraying apart and stitched the rest of the remaiing seams. I added a few more motifs - some lace flowers, a button cluster, and a bead motif. My favourite part of what I did on this block is still the spider and web. I thought they looked quite realistic when done so was very pleased with them. This block belonged to Gina, one of the ladies who had to drop out of the round robin. Once again, it was mostly seams that needed to be done at the end so I finished them up. This breathtaking block was made by Lisa. Her colours were wonderful and she included in her package she mailed around ribbons, threads and beads to coordinate in case the stitchers didn't have anything suitable in their own stash - very thoughtful! I think we used almost all the laces - they were so lovely! On this one I added some braid, couched ribbons, silk ribbon embroidery, laces, and, of course, more seams. This morning's mail brought me the buttons from the Embellished Button Swap we had at CQI and I love them! I had sent seven buttons in so received these seven beautiful buttons back. Below I'm adding an extreme closeup of each one along with the information on who made it - I want to give credit where credit is due. This first button was made by Lorrie Ramsay in Canada and can you believe this gorgeous thing was made with.... wait for it...... shrink art! How cool is that? I have a bunch of that stuff still kicking around from when the kids were using it for crafts so now I am going to have to dig it out and do some experimenting. This red and white button was embellished by Maria Silva in Portugal. The little red lace motif is fussy cut and attached to a red button and then adorned with a bit of tatting and red and pearl seed beads. Very creative! Carol Davis of Alabama made this beautiful ribbon flower button - I know just the block that is calling out for this one! Beth Pile of New York made this button - I think it must be from some kind of polymer clay and it is perfect to be added to the cushion I am working on for dd. Darlene Doerscher of Michigan did this beautiful beaded button. This is definitely another technique I am going to have to find time to experiment with - I love the way it looks and I think it will be a wonderful addition to any cq project. This button is another made by Carol Davis. I have no idea how she did this but I just love it! Last, but certainly not least, another beaded button - this time from Pam Pincha-Wagener in Washington state. I am totally blown away by the work and creativity in all these buttons and totally inspired to get to work on some of my own using these techniques. Another great CQI swap!! I have just finished another block in the Tea Time DYB Round Robin I am in at CQI. In DYBs (Do Your Block) each person makes six blocks which are each six inches square and one block is fully embellished by each of the other stitchers in the round robin - you receive five of your blocks back completed as well as one for you to finish yourself. This one belongs to Peggy Sue and all of her blocks were in these lovely pastel cottons with a tea cup already appliqued on it. As soon as I saw the little teacups, I couldn't wait to fill one with silk ribbon embroidered flowers! I started the bouquet by trailing down some little pink flowers - these were from a little vintage bouquet of the type that used to be on Sunday hats for little girls. I made a few spider web roses next. The remaining spaces were filled in with french knot flowers, detached chain stitch (lazy daisy) flowers and filler, ribbon stitch leaves and a bit of embroidered fern. The seam treatments on this block were all made using Japanese silk perle and buttonhole threads. I added a large cluster of beaded flowers as well as a button cluster. The last thing I added to this block was the words "Come to Tea" stitched with metallic sewing thread, using back stitch with waste canvas. I hope Peggy will like the block because I certainly had fun stitching it for her.